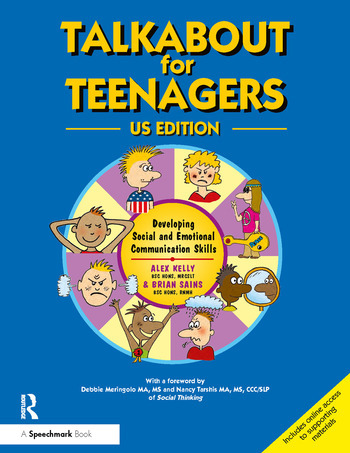 Talkabout for Teenagers is a comprehensive program of professional resources to help you deliver group sessions on social and relationship skills for teenagers with social, emotional or behavioral difficulties. The program follows the Talkabout hierarchy, building self-awareness and self-esteem first, then moving on to non-verbal communication, talking, friendship and assertiveness. group cohesion activities help you to ensure that all participants benefit fully from attending your group sessions. Suitable for Speech and Language Pathologists, Teachers, Social Workers, Child Psychologists and School Counselors, Talkabout for Teenagers has been thoroughly updated and edited for a US audience. "This next installment of a proven social communication skills curriculum series does not disappoint! The straightforward writing, clear protocols for assessment and practical guidance are exactly what busy teachers and therapists need to help them plan and implement social learning lessons for students." (From the foreword by Debbie Meringolo MA, MS and Nancy Tarshis MA, MS, CCC/SLP of Social Thinking). A social skills assessment framework enables you to evaluate a young person's social skills and identify where to start work. The huge range of activities, group discussions and handouts for each level of the program mean that you have everything you need to deliver a successful social skills curriculum. Alex Kelly is a Speech & Language Therapist who specialises in working with people with social skills and relationship skills difficulties. She currently runs her own business providing social skills training and consultancy to schools and organisations across the UK and overseas. Brian Sains spent 15 years working with adults and children with social and relationship skills difficulties and 10 years working as a community learning disability nurse where he specialised in working with men with relationship skills difficulties. He now runs Alex Kelly Ltd alongside his wife Alex.